Sea Foam Motor Treatment and Tune up Review - is it any good? Sea Foam products are probably some of the most well known in the whole industry. Having been around for more than 70 years; The Sea Foam company has had plenty of time to refine their products to the highest standard imaginable. There is little that this Sea Foam Motor tune up product cannot accomplish and for an affordable price to boot. It may not be the strongest cleaner out there, but its versatility is hard to beat. Being able to apply the product in so many different ways and for so many different engines goes a long way towards providing the end user with more options on how to care for their equipment. The Sea Foam Motor Treatment is a common sight in repair shops and garages across the country and for good reason. 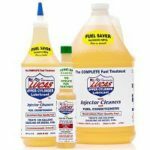 It’s both affordable and versatile; you can use it on your gasoline or diesel engines and it’s suitable for not only cleaning tasks but also for fuel treatment as it helps with lubricating the engines and protecting them from wear and tear. Due to its wide range of applications, this Sea Foam product doesn’t excel at any one task; however, thanks to its gentle ingredients, it is much safer than other industrial strength cleaners. For general maintenance and cleaning purposes it’s an excellent product. 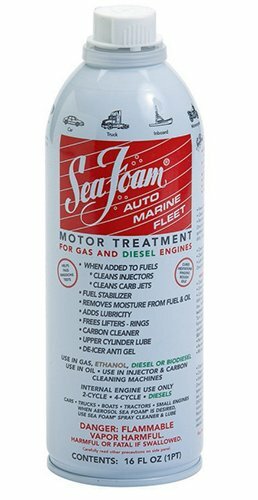 If you are looking for even more ways to utilize the Sea Foam motor treatment; The Sea Foam Spray is a great variation of the standard product. 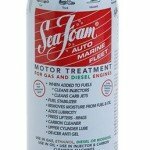 Sea Foam Motor Tune Up products range from 12 oz. aerosol cans all the way up to 1 gallon jugs. Buy in bulk to save cash or test out a single can to start with! I used sea foam,poured a can through my air system-brake booster.and now my jeep is iguess you woud say studering,missing,any Idea why? Various cleaners my cause temporary performance weirdness after you use them, but they shouldn’t persist. If there’s a lingering issue, I suggest having a mechanic check it out. The cleaners should never do any damage unless poured into the wrong place. Obviously didn’t use product as intended. Website and can clearly state to use the upper engine, intake cleaner spray, not the liquid. That goes in the tank and engine oil. Also don’t pour it in the brake booster! Put it trough the throttle bottle before the valve and keep throttle up. Use product as advised! This stuff is awesome. My truck was stalling out when I was idling. Went to the store and got Sea foam motor treatment, instantly my car was running properly again. What kind of car do you have? My car is doing the same thing ! I have an 01 infiniti i30. I’ve heard good and bad about seafoam.. but still don’t know what to do. I can’t afford to change the fuel filter right now. I have a 05 Mazda 6 and had tugging and jerking after using another gas treatment. My mechanic told me to use Seafoam and put premium gas in the car (fill up) I ran it about 30 miles already and haven’t felt the tugging anymore. I have a 2011 cruze. I used a can of spray sea foam. Theres no difference in preformace still has carbon build up. I injected it through the throttle body. Had a slight hesitation for the first 45 km and cleared up. You don’t need seafoam crap…if you do the above your car will run like a dream. Don’t confuse people people with your engine oil change intervals. 3000k=3,000,000 miles. You’re definitely gonna change your oil before the 3mil mile mark. For the record, most synthetic oils are rated for much higher oil change intervals, so you can definitely run them past the conventional 3k mile mark. If you are going to change synthetic oil every 3k miles, you might as well just run conventional oil. I cannot speak on the other products you recommended as I don’t know about them. If you believe that higher octane is always better, you obviously don’t know what you’re talking about. Sorry. GABOR is a clueless Clown! Change your Oil with Synthetic Oil every 3000Kilometers that means you change your oil every 1864 miles. Synthetic Oil is 2-3 times the cost of conventional oil. You’ll be wasting alot of $ if you do this. The weight and viscocity that you should use depends on your vehicle. If your vehicle doesn’t require Premium Gas no need to spend extra $ it doesn’t do anything for you but lighten your wallet. If you want to run STP Oil Treatment during the summer months or in a hot climate that’s fine. It just makes your Oil thicker or heavier so to speak. Sea Foam is a great product and I use it all the time. Basically just stick to the common sense maintenance tasks such as regular Oil changes, Transmission Fluid Changes, Coolant changes and mechanical maintenance Brakes, Shocks Struts, etc. and your vehicle will last a long time. Unless it’s a Mopar or Chevy. I own a Toyota. I have 130,000 Miles on it and it still runs like new. Put Seafoam In My 2001 Toyota Camry 4 cyl 107,000 miles. Ran Half A Tank Of Gas And Engine Light Came On. Code Reader Shows Bad First Bank O2 Sensor. Read Reviews And This Stuff Gets Super Hot And Destroys Sensors. I Suppose That Is What Cooked My Sensor. Never Again Will I Use Seafoam. There Is No Such Thing As A Mechanic In A Can. Sea foam removes carbon build up, ur air flow sensor maintains your air fuel and is located on exhaust down pipe. Ur o2 sensor simply monitors your catalytic converter, if it showing bad it means ur sensor needs to be cleaned from the carbon that got flushed thru ur system, it if is a cat code our cat is bad because the sea foam did its job and cleaned it, and now can give off a good signal. I’m a mechanic and use it at work. I notice you get some pinging (preignition) which can be damaging over a long period of time, but it goes away within a few blocks of driving. I used on my 2002 Honda accord 4cl. through break booster vaccum hose 3 oz and 5 oz gas tank. It ciean carbon and clock my egr ports so i had to took it mechanics to clean up 6 hole it cost me $450. My car has 155000 mile. Sean than once a while i use 4oz in full tank of gas not in buster.car is running fine now. Will sea form use in oil crankcase /clean Pistons , vales , rings!!!!! Will it stop your car from blowing blue smoke! My wife’s A6 Audi has been acting funny and the engine light would come on no matter what I did. I installed coils and plugs and you name it. I work on cars my since I was 13, I run scans on and problems would show up then disappear. My 17.5 hp riding mower started to only run on full choke and with the blades engaged would only run about 15 seconds. Eliminated vacuum lines, fuel filter, plug as cause. It was carb issue, as a last resort before actually taking it off I decided to put sea foam in the fuel. Ran it for about 10 minutes, working the throttle and it got better. I was able to mow back yard with choke on. Moved to front yard and it started to stall so I moved throttle to run, it cleared whatever was in the carb and ran like new! Didn’t have to take carb apart and now runs like a champ! Oh by the way I ended up using like half a bottle, way more than it calls for but it worked. I was revving my ‘82 F150 with 300 six in it much higher than I should have been. Threw a rod which punched a hole in the side of the block. I poured a can of Seafoam into the engine. Most of it ran out the hole in the block but enough stayed in that the broken parts reassembled themselves, the hole healed, and the engiystarted right up! Didn’t even have to add any oil! Amazing product! Tad, This is brilliant. You must be so happy. now you can drive that ford for another 30 years! I put Sea Foam SS14 Cleaner and Lube as instructed on the can but now my car is running rough and the check engine light is flashing unless the car is idling then it stays on solid. When I first put the Sea Foam in it quieted down my motor then all of a sudden it runs rough and white smoke comes out when I start it. Does anyone have a suggesting to fix this? Take it to the local scrape yard…solved! seafoam ate my carburetor in my 1964 ford never make that mistake again that was a four hundred dollar mistake.